The native of Prince Albert, Saskatchewan, doesn’t know the duration of this stint with Anaheim Ducks as the team regains its health, but the energetic 33-year-old forward has enjoyed every moment since his recall from the AHL San Diego Gulls a couple of weeks ago. 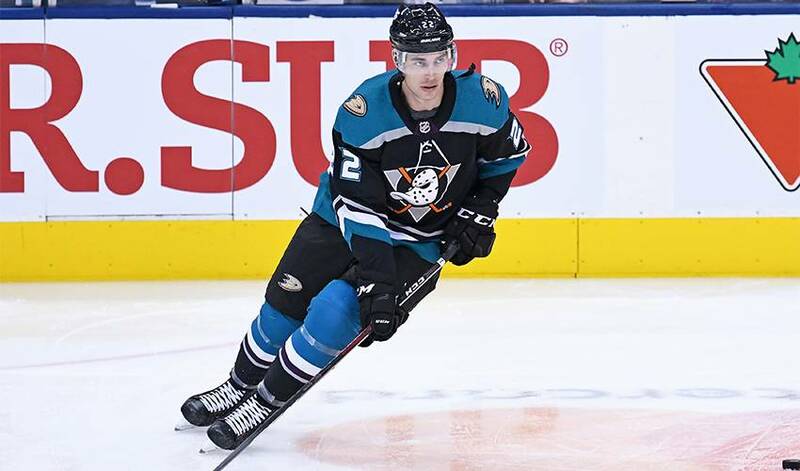 When he suited up for the Ducks in a 5-1 loss to the St. Louis Blues on Jan. 23, it was Cracknell’s first NHL game since Oct. 19, 2017, when he was with the New York Rangers. The Ducks were his 18th different sweater in 14 seasons as a pro, if you include his four games with Canada at the Spengler Cup in late December. “Yes, that’s correct, 18 teams,” said Cracknell, who was asked if he has a collection of all his seaters. The Calgary Flames chose Cracknell in the seventh round, the 279th of 291 players selected in the 2004 NHL Draft. After his fourth and final season of junior with the 2005-06 WHL Kootenay Ice, in which he finished second in league scoring behind Troy Brouwer with 42 goals and 93 points as an overager, he finished the year with a six-game stint with the AHL Omaha Knights. But the following season he began life as a full-time pro on the bottom rung with the ECHL Las Vegas Wranglers. From there he made stops in the AHL with Quad City, Peoria, Chicago, Springfield, Hartford, Laval, Toronto and San Diego. In between, there were promotions to the NHL with the St. Louis Blues, Columbus Blue Jackets, Vancouver Canucks, Edmonton Oilers, Dallas Stars, Rangers and now the Ducks. In total, he has suited up for 862 regular season and playoff games with his 18 teams, including 121 in the ECHL, 517 in the AHL, 220 in the NHL and four with Team Canada. Cracknell has been claimed on waivers three times, signed as a free agent on five occasions and been a part of three trades. It was about the same time he was playing for the AHL Toronto Marlies two months ago and he was traded to the Ducks organization when Team Canada approached him about playing in the Spengler Cup. On Team Canada, he played with former St. Louis Blues teammates Maxim Lapierre and Matt D’Agostini. Cracknell also was able to spend time with former Vancouver Canucks defenceman Kevin Bieksa, whom he cheered for as a teenager when his family moved to Victoria and later played against. The last two seasons have been particularly difficult for Cracknell. He has moved from the Rangers to their AHL affiliate in Hartford, traded to Montreal’s minor-league team in Laval, signed by the Maple Leafs but toiled with the AHL Toronto Marlies. He then was traded to the Ducks organization, played for Canada, the AHL San Diego Gulls and now the Ducks. The hard-working, versatile forward remarked that a strong family, good support and an interest in reading inspirational books has as kept him chasing his dream. He highly recommends Can’t Hurt Me: Master Your Mind and Defy the Odds by United States Navy Seal David Goggins. Gulls head coach Dallas Eakins has had Goggins speak to his team. His message of the importance of overcoming the odds with a strong mental skillset has struck a chord with Cracknell. “There is so much out there on ways to think positively,” Cracknell said. “I read a lot of books on it. I’ve also had good coaches who understand you and are good in communicating how you fit in. “Also, when you come into a dressing room the hockey culture helps a lot. You get to know a lot of guys who maybe go out of their way to help you out and make you feel you comfortable.